A liquid, alkaline, foaming cleaning agent for removing stubborn deposits of dirt etc. from autos, lorries, buses, trains and other alkali-resistant surfaces. Vehicle cleaning: Specially formulated for stubborn or heavy soiling on cars, lorries, construction equipment, buses, and trains. Industrial applications: where it is highly effective in removing grease or oil from machinery or work pieces. Economical to use, because it is highly effective in small concentrations. Reduced equipment maintenance costs because of corrosion-blockers in the formula. Produces excellent results in a short time because it is powerful, yet gentle to painted surfaces. Friendly to the users and the environment because of a high degree of biodegradability. Cleaning of cars, trucks, buses and commercial vehicles in self-service car washes or by high-pressure cleaner. 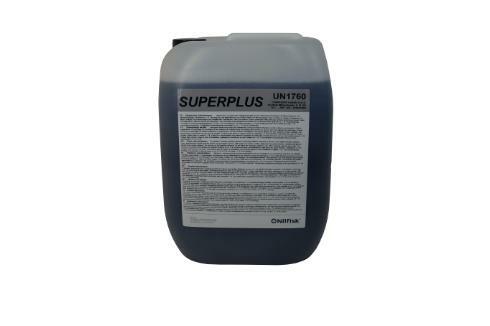 High Pressure Washers: Dilute SuperPlus 1:10 (10%) in the detergent tank of the machine, and set the detergent injector for between 1 and 5%, depending upon the degree of soiling. Self-Service Car Wash: Use as above, or set the car wash equipment to result in a concentration of between 0,1 and 0,5% in the cleaning detergent spray mode. Always rinse thoroughly, when finished cleaning.